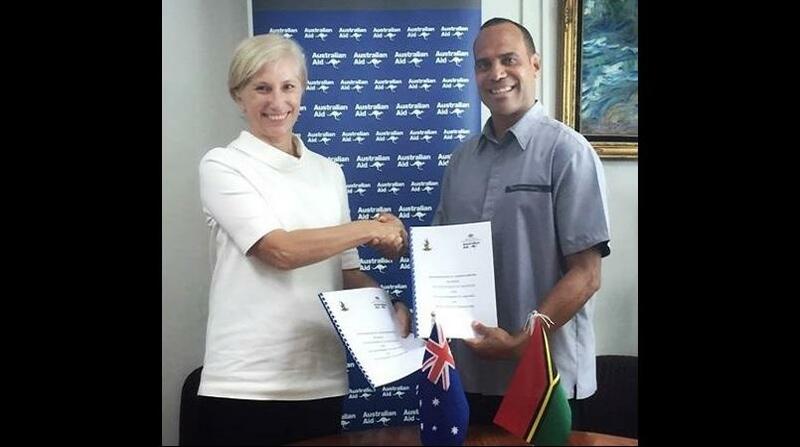 Australia and Vanuatu have signed a Memorandum of Understanding (MoU) to ensure the two countries development cooperation contributes effectively and efficiently to sustained and inclusive economic growth and poverty reduction in Vanuatu. The MOU was signed by the newly appointed Minister of Foreign Affairs, International Cooperation and External Trade, Ralph Regenvanu, and the Australian High Commissioner, Jenny Da Rin, in Port Vila Monday. Australia is Vanuatu’s largest development partner providing almost six billion vatu annually through the Australian aid program to help Vanuatu build resilient infrastructure and improve economic opportunity, provide essential health and education services, improve community safety and resilience, and to rebuild after Tropical Cyclone Pam. Australia is also working closely with Vanuatu to defend its territory, through the Defence Cooperation Program, and to improve economic opportunities through tourism, seasonal work and trade, including the Pacer Plus trade agreement. Ms Da Rin congratulated Minister Regenvanu on his appointment as Minister of Foreign Affairs, International Cooperation and External Trade. She presented the Minister with congratulatory letters from the Australian Foreign Minister, Julie Bishop, and Trade Minister, Steven Ciobo. “Australia greatly values the unique and strong relationship with Vanuatu, from which both countries benefit,” she said. “The Government of the Republic of Vanuatu thanks the Government of Australia for their continued support and looks forward to closer collaboration on the implementation of the partnership agreement,” said Minister Regenvanu. Australia has been a long-standing partner of Vanuatu for almost 40 years. Australia first established a presence in Vanuatu in January 1978 and both countries have worked ever since to nurture and grow the relationship, based on mutual trust and respect. Photo supplied. Caption: Australian High Commissioner, Jenny Da Rin, and Foreign Minister, Ralph Regenvanu sign a Memorandum of Understanding.